Giant Lobelias growing at 4000 metres on Mount Kenya National Park/Natural Forest. A United Nations-backed project in Kenya is protecting forests and wildlife, as well as providing alternative livelihoods, and offers valuable lessons on how governments and the private sector can successfully work together for the betterment of communities and the environment. The project is run through the UN Collaborative Programme on Reducing Emissions from Deforestation and Forest Degradation (REDD+), which seeks to create financial value for the carbon stored in forests, offering incentives for developing countries to reduce emissions and invest in low-carbon technologies to sustainable development. The Kasigau Corridor REDD+ Project is protecting 200,000 hectares – 500,000 acres – of dryland forest in south-eastern Kenya in a vital wildlife and biodiversity corridor between two national parks, Tsavo East and Tsavo West. Nearly 150,000 rural Kenyans are benefitting from the distribution of revenues from the sale of the carbon offsets in the project, which is carried out with private sector partner Wildlife Works. “The fundamental purpose of Wildlife Works is to take the pressure off natural resources, particularly forest-based resources, by creating an environment of alternative livelihoods,” said Bryan Adkins of the Kasigau REDD+ Project. “It’s a social enterprise, which means that it puts the value of community input and community involvement at the forefront of its mission,” he added. Mr. Adkins noted that, in the Kasigau corridor, impoverished communities are often forced to “leverage the landscape” to make ends meet, to feed their families, to clothe their children and provide for their basic needs. Wildlife Works was able to sign agreements with the community groups that owned the land in the corridor for management rights in return for a dividend to the groups, thereby being able to manage the forest resources in a “non-consumptive” way towards generating carbon credits. The revenue generated from those carbon credits, said Mr. Adkins, is re-invested into the community in three “pots” – a direct dividend to the landowners themselves, the continuing operation of managing the land, and directly into the community through Wildlife Works’ ‘carbon trust’ for development projects. In terms of biodiversity co-benefits, the project has documented measureable and verifiable increases in “high conservation value species” such as lions, elephants and cheetahs. There has also been significant landscape recovery in areas that had previously been degraded or deforested completely, Mr. Adkins said. The social co-benefits include alternative livelihoods for the people of the area thanks to an increase in investors and strategic partnerships. This includes the creation of a clothing factory in the area to provide jobs so people do not have to be involved in activities such as charcoaling or illegal wood extraction. Companies such as Puma and SOKO have both invested heavily in an eco-clothing factory, which provides around 150 jobs in the area – which is significant, Mr. Adkins noted, for an area which had very little external investment before the project. “All of this is done through a very collaborative approach with the Kenya Forest Service,” he stated, adding that its support was “very evident” throughout the project. The Kenya Forest Service is a semi-autonomous agency set up in 2007 to conserve, develop and sustainably manage forest resources for the country’s socio-economic development. It is managed by a board of directors drawn from both the private and public sectors that has the mandate to oversee the development of the entire forest sector. Forests play a vital role in the life of the East African nation, where 70 per cent of the population of 40 million is engaged in agriculture, and 70 per cent of the energy demand is met from wood and charcoal, which are the main sources for cooking and heating. According to a mapping exercise carried out in 2010 with the help of the Japanese Government, the forest area in Kenya is nearly 7 per cent. The country’s forests fall into five categories: natural/indigenous forests, including mangroves; industrial plantation forests; private forests; dryland forests; and urban forests. The establishment of the Kenya Forest Service is just one of several reforms and measures taken by the Government to create an enabling environment for investment in the sustainable management of forests. As part of the reforms, the Government promulgated the Forest Act in 2005, marking a “fundamental shift” in that the old legislation did not provide for community participation, said Patrick Kariuki of the Kenya Forest Service. The country also has a blueprint – Vision 2030 – that aims to move Kenya to a middle-income country by 2030. “Within this blueprint, we have key targets for the forest sector, especially with regard to supporting forestry protection, conservation and development,” Mr. Kariuki stated. The reforms have led to an increase in public financing for the forest sector – a 200 per cent increase to $7.5 billion in the current financial year. 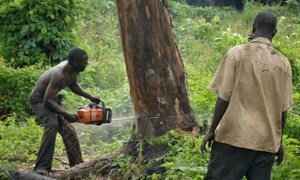 They have also led to more partners in the forestry sector; an increase in community participation; greater investment by the private sector; and resource mobilization from other sectors in the economy that benefit from the ecology services of forests such as energy and water. He cited several critical factors in this regard, including the explicit support of the Kenyan Government in creating an enabling investment environment and in creating a law enforcement environment which allows property rights and tenure to be enforced in a way without creating tensions. “This collaboration has also been extremely meaningful in creating examples of how the government and the private sector can actually play a key role together in the local community, at the local level,” stated Mr. Adkins. A landmark study of Kenya’s high-elevation forests shows that the economic cost of deforestation in the East African country exceeds national gains from forestry and logging by more than four-to-one, the United Nations Environment Programme (UNEP) said today.